The traditional Polynesian wedding is a unique opportunity to celebrate love or renew vows in one of the most romantic place in the world. The experience is unforgettable… celebrated with local customs and the legendary “joie de vivre” of the Tahitian people. It offers a magical moment out of the time. 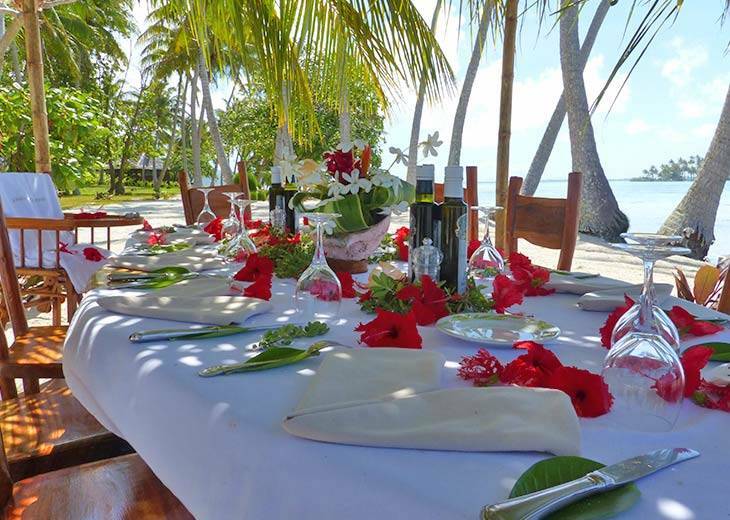 A wedding at Vahine Island is even more exceptional as it takes place in a setting of a rare natural beauty, which has preserved the authenticity of French Polynesia. Vahine Island offers a “symbolical” ceremony on the white sand beach, facing the pristine lagoon, with views of Tahaa, and the magnificent island of Bora Bora. It is led by a Tahitian “celebrant” following the ancestor’s traditions of the Maohi population. Before the ceremony, you are dressed with the traditional white wedding pareo (or their personal clothes at choice) as well as necklaces and crowns of flowers. Then, you are escorted to the beach and will be greeted by the celebrant, and according to the package booked, by the musicians with their traditional loves songs and the sound of the Ukulele. Then the celebrant invites you to take place on the wedding chairs to begin the ceremony with prayers and gods invocations. It carries on with the benediction and the inscription of the Tahitians names on the traditional wedding certificate of Tapa (vegetal fiber). To end the ceremony you are wrapped into the “Tifaifai”, traditional embroidered quilt symbolizing the union. The traditional ceremony can be enhanced with services depending on the chosen package and lasts between 20 to 45 minutes. We are delighted to offer our ceremony options.